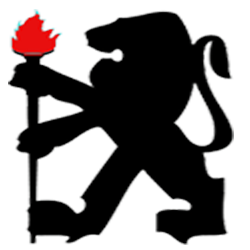 Welcome to the 55th issue and April 2018 edition of the Lion Monthly Newsletter! Thank you for taking the time to visit our website and newsletter; we hope you find this month’s issue useful. This year has been speeding by rather quickly and April signals that those perfect spring months have arrived. We find this the best time for preparing for the prime summer months of grilling if you’re in the market for a new grill, outdoor kitchen, etc. This is also a fantastic time for grilling outdoors depending on your location of course. We have quite a bit of content lined up for this month’s edition which we’ll outline just below. As we stated above, we have quite an issue ready for you this month. Kicking things off, we take an in-depth look at what makes our cast stainless steel burners top of the line, both in performance and quality. Following that feature up we take a detailed look at our standard flame tamers and the upgraded ceramic tube trays as well as a full length feature and installation guide for our optional charcoal tray. We also have a recipe for grilled oysters that is extremely easy to prepare as well as being exceptionally delicious! Again, we would like to thank you and we hope you enjoy this month’s issue! There is no doubt that the burners of a grill are one of the most essential components of any BBQ grill. As such, the quality of the materials that went into creating the burner are vital and when you want to maximize your grilling potential you’ll want the best. The materials used to craft grill burners run the gamut from cast brass to cast stainless steel to cast iron. The power of the burner itself is measured in BTUs; BTUs can be used as a barometer for the overall grilling power of the grill and heat generation for cooking. Again, the quality of the burners need to be factored in as well when it comes to overall longevity and performance. 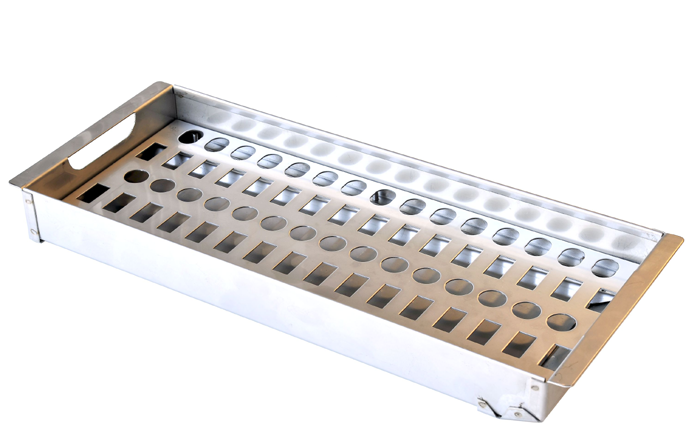 At Lion we utilize 304 grade cast stainless steel burners which are by far the superior model of burner created from heavy gauge stainless steel. 304 Grade Cast Stainless Steel Burners are by far the superior burner type. Cast stainless steel burners are solid pieces of metal and are not welded together which means that these burners are extremely durable and heavy duty. The 304 grade solidifies this as 304 grade is top of the line commercial grade steel. 304 grade typically consists of 10% Nickel and 18% Chromium. Cast stainless burners are also extremely resistant to rust due to the composition of the burner itself. Heat generation and longevity of these burners is also top notch. Our cast stainless burners output 15,000 BTUs apiece! Where as other materials used to create burners may be prone to warping, rusting, etc. cast stainless is not prone to those same issues at all. It’s clear cut that cast stainless (304) is by far the best. Cast Iron Burners are extremely heavy duty and durable. They do tend to suffer from excessive rusting, which can happen quite quickly, and as such they need to be maintained on a regular basis by using a wire brush to remove rust flakes and other assorted debris. 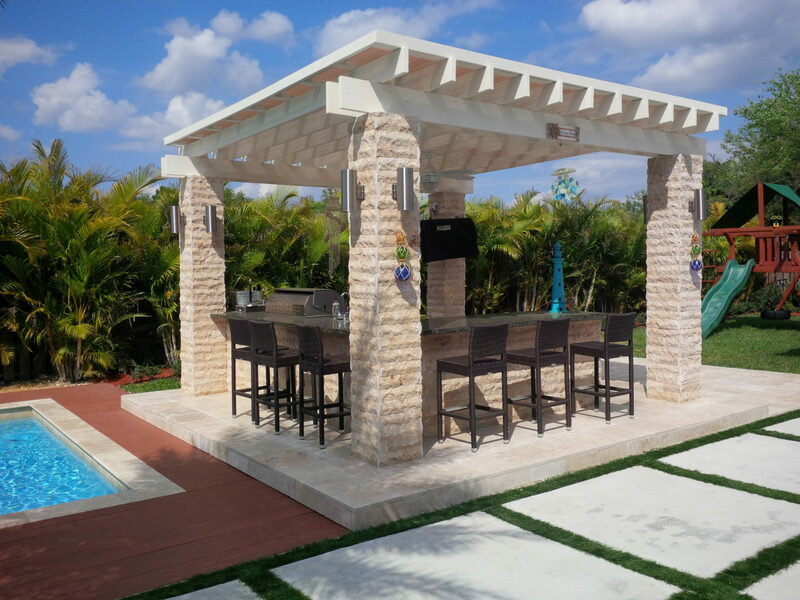 While heavy duty, the fact that they rust easily and fare poorly in any type of outdoor element that may produce rust (living by the ocean for example) makes them unsuitable for Lion Premium Grills. Cast Brass Burners are also heavy duty but unlike their cast iron counterparts, cast brass burners are extremely resistant to rust. The issue with cast brass is that the heat generation may cause them to warp, bend, or sag. Cast brass burners are generally high quality but we feel that cast stainless just outperforms it in every aspect and as such we use cast stainless steel. Stamped stainless steel are usually very low quality and make for extremely flimsy burners. They are usually made from low grade, light gauge stainless steel and are not one solid piece of metal; instead it's two pieces "stamped" together. These burners tend to be short lived. They are not made of 304 grade stainless steel, instead they are crafted from the lowest grades of steel. Avoid these at all costs. Flame Tamers tend to be an overlooked yet vital piece of any gas BBQ grill. Flame tamers are essentially a barrier between the cooking grids and the burners of the grill. These shields provide a handful of extremely important functions; first off, they protect the burners themselves from the majority of grease, oil, fats, marinades that seep through the grids, and various other drippings created during the grilling process. Why is this important? Well, for a few reasons. The burners themselves can be damaged or have their functionality severely impaired if they come into contact with these drippings. If this stuff touches the burners, the most likely result will be flare-ups, which, while not only potentially very hazardous to whomever is working the grill, will also impact whatever is being grilled. A shoddy flame tamer system can be extremely detrimental to the grilling experience, leaving one with unevenly cooked food, scorching or burning, etc. Flame tamers are also responsible for aiding in creating a more even transfer of heat across the entirety of the grill. Excess drippings will catch on the tamers and burn off, enhancing the overall flavor of whatever is being grilled. At Lion we have a standard stainless steel flame tamer and an upgraded version that is vented and also contains Italian ceramic heating tubes; this tamer is top of the line! Now that we have the basics of what constitutes a flame tamer and why they are so important to the functionality of your BBQ grill, let’s take a look at why our vented flame tamer is so good. It meets all the requirements that we have in place for creating a quality product: the vented tamer is constructed from 304 16 gauge stainless steel, the ceramic tubes are crafted from the finest materials, etc. We took painstaking care to make certain this flame tamer lived up to our standards. You can tell that these are high quality, as they even have that “feel” of something high-end. The flame tamer has a heaviness and sturdiness to it that speaks to the care taken when constructing this product. There are also other reasons why these flame tamers are heads and shoulders above the rest of the competition. Our Vented Flame Tamer with Ceramic Tubes is a full width flame tamer that stretches out to cover much more real estate than your standard flame tamer. The extra coverage provided results in an even greater amount of protection provided for the burners which means minimizing any flare ups, maintaining the integrity of your burners, and retaining even, precise heat distribution across the grill surface. All of this results in an easier, better cooking experience. As you can see by the picture above, each flame tamer tray houses 17 high performance radiant heat tubes crafted from Italian ceramics. This provides for 100% radiant heat, which allows for an incredibly even amount of heat distribution. The ceramic tubes will also catch any drippings and convert them to smoke which results in tastier food. The difference when grilling with these flame tamers is immediately apparent. What Materials Are Usually Used to Craft Flame Tamers? When it comes to flame tamers, the materials used to construct these grilling products tend to be one of two options: steel or ceramic. Stainless steel tends to be more popular, but some manufacturers use porcelain coated steel instead, which is far inferior to the stainless variant. When speaking about stainless there is also a wide variation in the grade of stainless steel used, from low grade, cheap stainless like 430 grade which will promptly rust with even the briefest exposure to the elements, to high grade, rust resistant 304 grade which we at Lion Premium Grills utilize. The other alternative is ceramic. Usually the ceramic element is housed in a steel tray or holder where the ceramic briquettes or rods are held in place. Ceramic tends to be more fragile than stainless steel but it also tends to impart better, richer flavors when used to grill with as well as being easier to use for even heat distribution. Our top of the line vented flame tamer utilizes Italian ceramic tubes, which are held within a 16 gauge stainless steel tray. The best of the best. Welcome to this month’s featured grill recipe! This month we have a recipe that is both delicious as well as incredibly easy to prepare — grilled clams with lemon shallot butter. 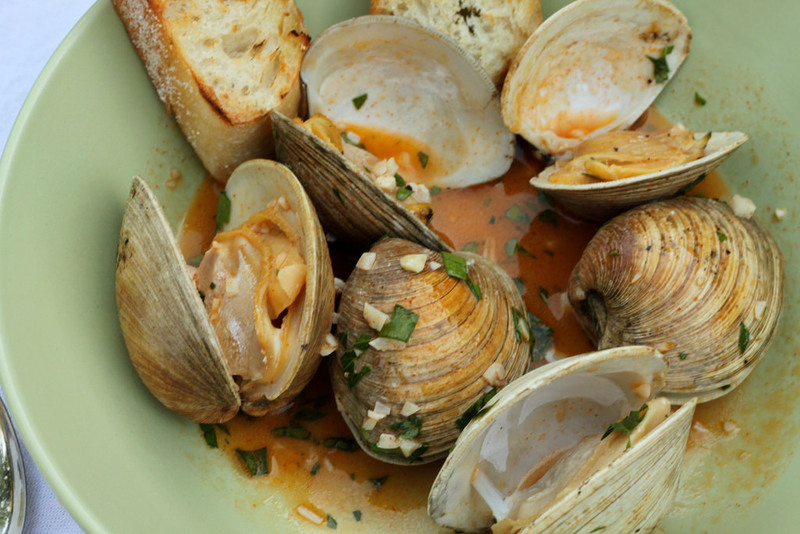 Grilling clams is our favorite preparation method at Lion and it’s very easy to do as you’ll see below. Pair these with some white wine and crusty bread for an amazing treat. We hope you enjoy! First off, we’ll start off by preparing our clams. You can use another variety but we like using littleneck clams. 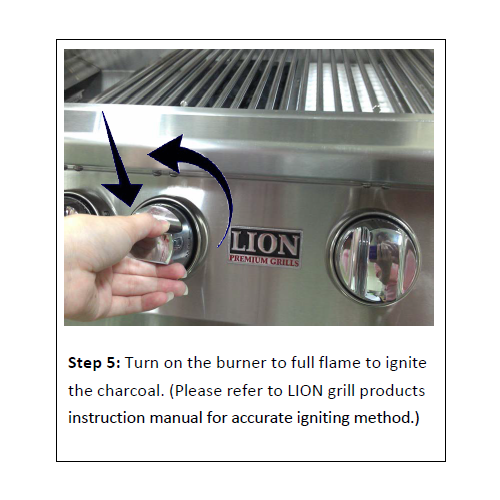 Turn your Lion BBQ grill on and pre-heat the grill to medium-high heat. Once your grill has reached the desired temperature, place your clams directly on the cooking grates. After roughly three to five minutes they will begin to pop open; once they do they’re ready. Place them in a large bowl once they pop open during that particular time frame. Set them aside and begin your lemon-shallot butter preparation. This, much like prepping the clams, is very quick and easy to prepare. Take your unsalted butter, parsley, chives and chopped shallot and mix them together in a bowl. Add your lemon zest and continue to mix. Once you’ve fully mixed this, season with salt and pepper. Add this mixture to your bowl with the grilled clams. Toss the lemon shallot butter with the clams, generously coating the clams with the butter mixture. Garnish liberally with your parsley and basil. 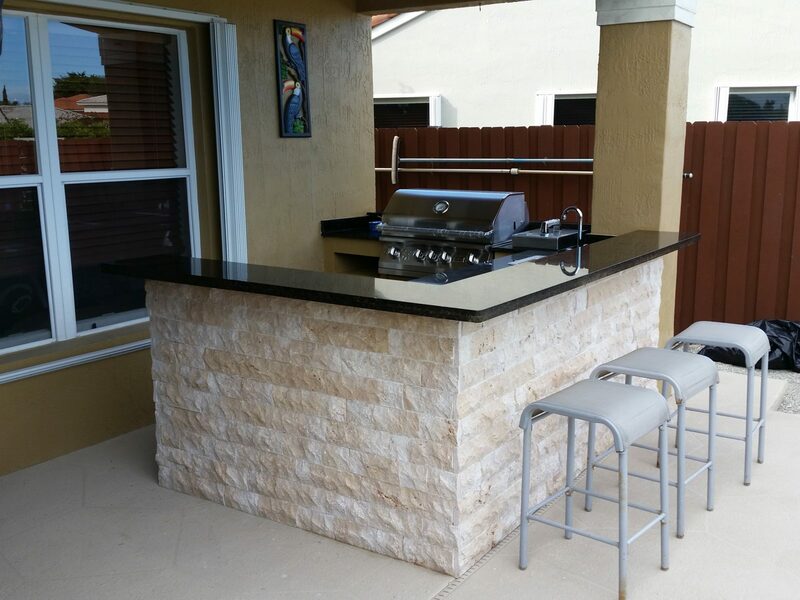 Our Lion Premium Grills Charcoal Tray is exclusively designed for use with our line of luxury built-in gas BBQ grills. Adding this tray to your unit completely expands the grilling possibilities, adding the much desired need to utilize charcoal with our grills. Multi-purpose and multi-faceted, our Charcoal Tray will greatly enhance your grilling experience with Lion Premium Grills. 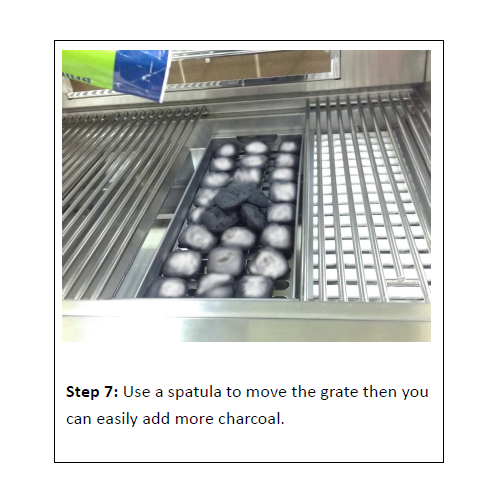 Below you’ll find step-by-step instructions on how to set up and grill with our charcoal tray. We are extremely proud to present one of our favorite grilling accessories — the charcoal tray. The benefits of using our charcoal tray are enormous to say the least; you can instantly enjoy the trademark smokey charcoal flavor profile regarding anything you feel like grilling but on the comfort of your Lion BBQ gas grill. Lighting the grill requires no messy lighter fluid either; you just use the burner of your grill. The charcoal tray is constructed from high grade, heavy duty 16 gauge 304 stainless steel that is dual-lined and naturally rust resistant as well as being extremely durable. Our tray is made to withstand consistently high grilling temperatures. Any ash conveniently collects in the bottom of the tray, making for easy clean up and disposal. If you love the grilling properties of charcoal our charcoal tray will expand your grilling possibilities by tenfold. 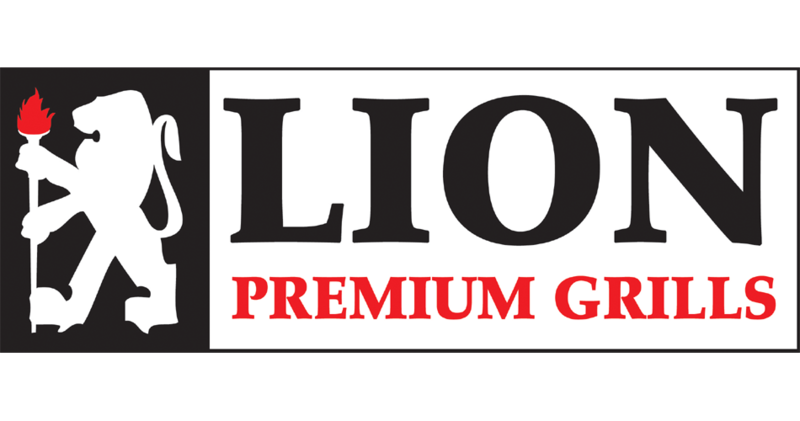 This accessory is one all of us at Lion Premium Grills considers an absolute must. 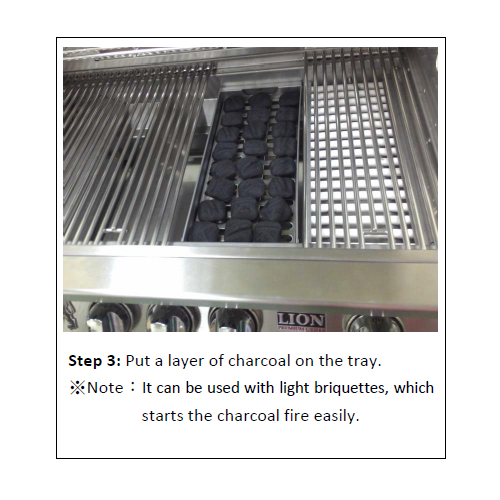 Welcome to the set-up and installation guide for your Lion Premium Grills Charcoal Tray. The process is really quick and easy but our step by step breakdown makes it even easier. You’ll be up and grilling with charcoal on a luxury built-in grill in no time! Starting things off, simply open up your grill hood and carefully remove the grill grate. Underneath you’ll see the flame tamer. Remove that as well. 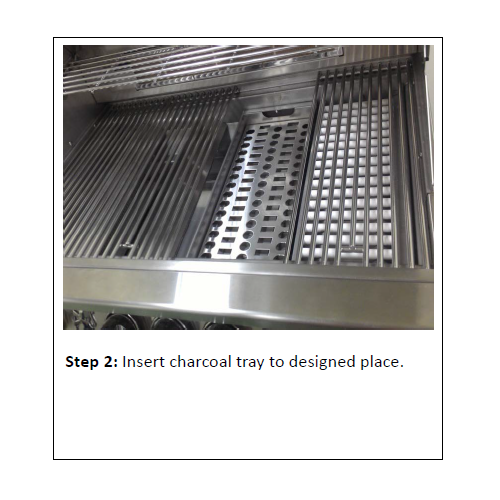 Welcome to the 2nd step of the installation guide for the charcoal tray. After having removed the grate and flame tamer, you can now insert the charcoal tray in the now open space of your BBQ grill. It should be easy to just drop into place and move on to the third step of the process. Now that the tray is laid in place you can now prep it for your impending grill session. At this point, you can grab your charcoal and place it evenly in the charcoal tray itself. The three evenly placed rows of charcoal briquettes that you can see below is a perfect method of placing the charcoal for your grilling purposes in this instance. At this point, we are almost ready to get to grilling with charcoal. It is recommended that you do not ignite the grill just yet. 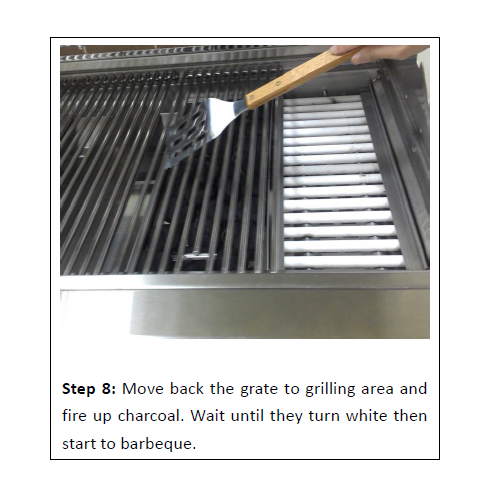 Make sure to place the grill grate into place over the charcoal tray. If the grill does happen to already be lit, be sure to use a spatula to position the grill grate back into place. 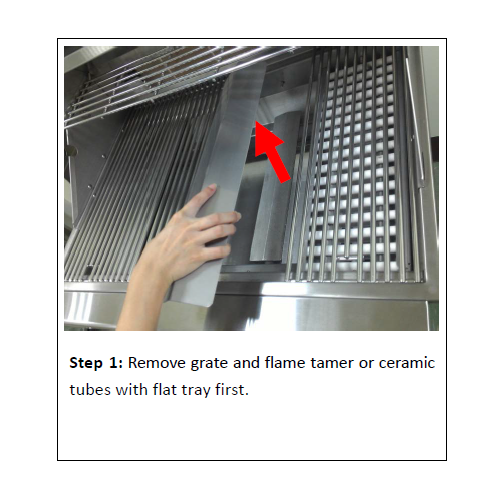 You also want the grate into place before igniting the grill so that the grate can also pre-heat. This is a quick and easy step. You are now ready to ignite the grill and prepare for cooking! Go ahead and turn the burner on to full flame to ignite the BBQ grill and subsequently, the charcoal in your charcoal tray. Charcoal takes roughly 5 to 10 minutes to ignite. 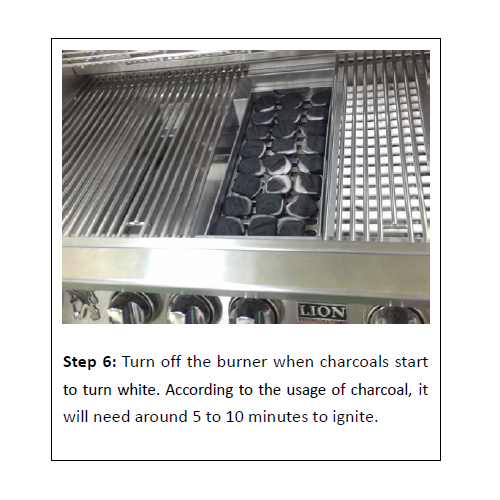 Once the charcoal itself begins to turn white, you may go ahead and turn off the burner on the grill. At this point, if need be, use a spatula to move the grill grate to the side. 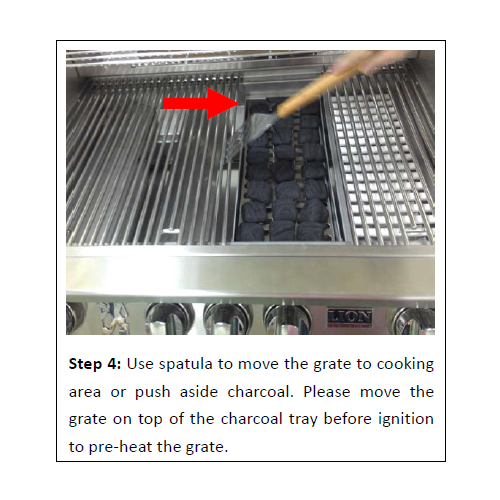 Add more charcoal and make any adjustments if you need to and using the spatula, move the grate back into position. After the grate is back into place, fire the grill up. Once the charcoal turns white, proceed to grill!